Game In Flame “is a strategy game that offers a glimpse into the fascinating world of body defence. The strengths and weaknesses of immune system cells as well as the effect of drugs for combating chronic inflammatory diseases in the joints, intestines and lungs are explained in a playful way. The browser game was created within the framework of the Collaborative Research Centre (CRC) 1181 “Switching Points for the Dissolution of Inflammation” and the Priority Program (SPP) 1468 IMMUNOBONE, both under the direction of the Department of Internal Medicine 3 of the University Hospital Erlangen-Nuremberg (FAU) of the University Hospital Erlangen-Nuremberg, in order to explain the latest findings of the research on the refined tricks of the immune system and at the same time to explain the awareness of affected persons. Anyone can access the game free of charge at www.gameinflame.de. Millions of people suffer from chronic inflammatory diseases such as rheumatoid arthritis, Crohn’s disease or asthma. This affects many young people who, in addition to experiencing severe pain, have to endure considerable impairments in their quality of life. Chronic inflammatory diseases are not curable so far. On the positive side, more than half of all patients with chronic inflammatory diseases have no signs of disease due to targeted, immunomodulating drugs and the corresponding adherence to therapy (compliance). 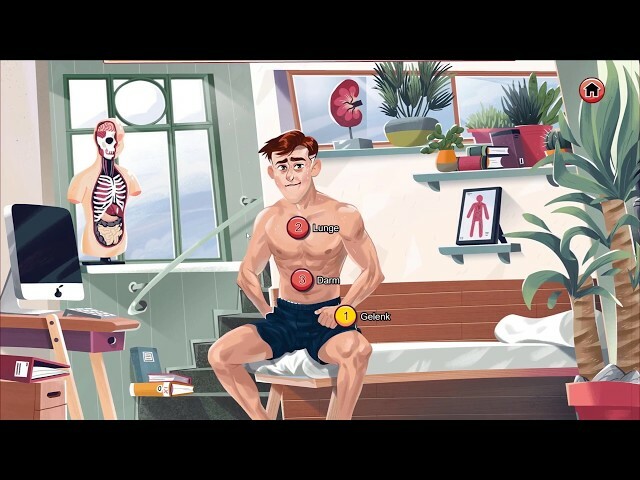 The educational game Game In Flame explains the good and bad aspects of inflammation and its cellular players in the joint, intestine and lungs. The first now online world plays in the human joint, it is necessary to treat/prevent a gout attack. For this purpose, white blood cells, so-called neutrophil granulocytes, have to be strategically positioned in the joint: These belong to the first defence front of the immune system and defend the body against intruders. They can emit hydrogen peroxide and catch or simply “eat” dangerous substances such as uric acid crystals and bacteria with nets of DNA. In order to control the inflammatory reaction within six levels, players also have access to medications as special weapons. With just a few clicks, an “Immuxikon” provides players with information about the properties and functions of the cellular players as well as drugs in the body and in the game at any time. We would like to inform young and old about our science within the scope of the Collaborative Research Centre 1181. Due to the large number of patients with chronic inflammatory diseases, we hope that even more patients will understand what is happening in their bodies and what they can do to control their disease,”explains Prof. Dr. Georg Schett, spokesperson of the CRC 1181 and SPP 1468. In the coming months the learning game will be extended by two more game worlds. On the one hand, this involves an inflammatory mechanism in the intestine, which leads to diseases such as Crohn’s disease and ulcerative colitis due to incorrect regulation. Under the scientific direction of Prof. Dr. Markus Neurath (Department of Internal Medicine 1) the inflammatory reaction and corresponding immune cells in the intestine have to be fought to prevent the destruction of the epithelial barrier. In the summer, the third inflammatory world will go online, in which players will have to stop an asthma attack through the targeted use of antibodies in the lungs. In July, the digital game will also be available as an app for mobile iOS and android devices.